Adding support to the concept of mixed connective tissue disease as a distinct entity, in 1993, Mairesse et al described an autoantibody to the constitutive 73-kD heat shock protein found at high levels exclusively in patients with mixed connective tissue disease. This autoantibody was found in reduced levels in patients with progressive systemic sclerosis and rheumatoid arthritis. The autoantibody was not found in significant quantities in patients with systemic lupus erythematosus (SLE) or myositis. This finding has not been duplicated and must be interpreted with caution. However, the authors redefine mixed connective tissue disease as "a core of minor symptoms (ie, Raynaud phenomenon, puffy fingers, mild myositis, and arthritis) associated significantly with anti-U1-68kD antibody, defining an undifferentiated connective tissue (UCTD) disease that may ultimately overlap with features of major connective tissue disease." 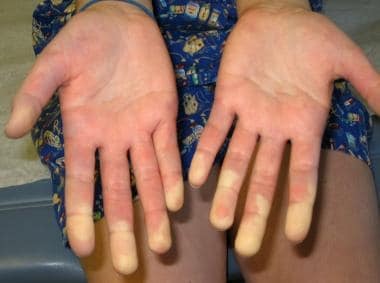 Although confusing, perhaps the best way to consider mixed connective tissue disease is as an undifferentiated connective tissue disease represented mostly by Raynaud phenomenon and anti-RNP antibody. See the image below. Raynaud phenomenon showing demarcation of color difference. This disorder may evolve into one of several major connective tissue diseases or to an overlap syndrome of the major connective tissue diseases. The evolution of this disease requires the physician to carefully assess and constantly reassess the patient in anticipation of change and to provide early intervention with appropriate medical therapy. Mixed connective tissue disease has features of several autoimmune diseases. For more details see Juvenile Rheumatoid Arthritis, Neonatal Lupus and Cutaneous Lupus Erythematosus in Children, Systemic Lupus Erythematosus, Systemic Sclerosis, Sjogren Syndrome,Dermatomyositis, and Myositis Ossificans. In a literature review, Michels counted 224 cases of mixed connective tissue disease. Pediatric-onset mixed connective tissue disease accounts for an estimated one quarter of all cases. Most large pediatric rheumatology centers in major cities have 5-15 active pediatric cases, although some studies estimate that mixed connective tissue disease occurs in 0.6% of all pediatric rheumatology patients. US data are derived from international data. Literature describes pediatric mixed connective tissue disease from individual case reports to small series. Mortality is 0-50%. The review by Michels found a mortality figure of 7.6%. More recent data assess pediatric mortality at 3-4 per 1000 population versus adult mortality at 12-23 per 1000 population. Serious organ involvement included 47% of patients with renal disease, 54% with restrictive lung disease, and 29% with GI disease. Although rare, morbidity from cerebral disease, cardiomyopathy, myopericarditis, and pulmonary hypertension has been reported and is associated with a significant risk of mortality. Ethnic distribution for pediatric mixed connective tissue disease has not been reported. Literature suggests that no specific protection or propensity based on race is noted. A female predominance, which is typical of other autoimmune diseases, is noted in mixed connective tissue disease. Three published series on pediatric mixed connective tissue disease report 89 of 105 patients to be female, or a female-to-male ratio of approximately 6:1. Alarcon-Segovia D, Villareal M. Classification and diagnostic criteria for mixed connective tissue disease. Kasukawa R, Sharp GC, eds. Mixed Connective Tissue Disease and Anti-nuclear Antibodies. 1987. 33-40. Kasukawa R, Tojo T, Miyawaki S. Preliminary diagnostic criteria for classification of mixed connective tissue disease. Kasukawa R, Sharp GC, eds. Mixed Connective Tissue Disease and Anti-nuclear Antibodies. 1987. 41-7. Mairesse N, Kahn MF, Appelboom T. Antibodies to the constitutive 73-kd heat shock protein: a new marker of mixed connective tissue disease?. Am J Med. 1993 Dec. 95(6):595-600. [Medline]. Nowicka-Sauer K, Czuszynska Z, Majkowicz M, Smolenska Z, Jarmoszewicz K, Olesinska M, et al. Neuropsychological assessment in mixed connective tissue disease: comparison with systemic lupus erythematosus. Lupus. 2012 Mar 20. [Medline]. Berard RA, Laxer RM. Pediatric Mixed Connective Tissue Disease. Curr Rheumatol Rep. 2016 May. 18 (5):28. [Medline]. Michels H. Course of mixed connective tissue disease in children. Ann Med. 1997 Oct. 29(5):359-64. [Medline]. Tsai YY, Yang YH, Yu HH, Wang LC, Lee JH, Chiang BL. Fifteen-year experience of pediatric-onset mixed connective tissue disease. Clin Rheumatol. 2009 Sep 16. [Medline]. Ortega-Hernandez OD, Shoenfeld Y. Mixed connective tissue disease: An overview of clinical manifestations, diagnosis and treatment. Best Pract Res Clin Rheumatol. 2012 Feb. 26(1):61-72. [Medline]. Sharp G. The origin of mixed connective tissue disease: a stimulus for autoimmune disease research. Lupus. 2009. 18(12):1031-2. [Medline]. Malleson PN, Mackinnon MJ, Sailer-Hoeck M, Spencer CH. Review for the generalist: The antinuclear antibody test in children - When to use it and what to do with a positive titer. Pediatr Rheumatol Online J. 2010 Oct 20. 8:27. [Medline]. [Full Text]. Hetlevik SO, Flatø B, Aaløkken TM, Lund MB, Reiseter S, Mynarek GK, et al. Pulmonary Manifestations and Progression of Lung Disease in Juvenile-onset Mixed Connective Tissue Disease. J Rheumatol. 2018 Aug 1. [Medline]. Ingegnoli F, Zeni S, Gerloni V, Fantini F. Capillaroscopic observations in childhood rheumatic diseases and healthy controls. Clin Exp Rheumatol. 2005 Nov-Dec. 23(6):905-11. [Medline]. Hughes M, Moore T, O'Leary N, Tracey A, Ennis H, Dinsdale G, et al. A study comparing videocapillaroscopy and dermoscopy in the assessment of nailfold capillaries in patients with systemic sclerosis-spectrum disorders. Rheumatology (Oxford). 2015 Aug. 54 (8):1435-42. [Medline]. Pizzorni C, Giampetruzzi AR, Mondino C, Facchiano A, Abeni D, Paolino S, et al. Nailfold capillaroscopic parameters and skin telangiectasia patterns in patients with systemic sclerosis. Microvasc Res. 2017 May. 111:20-24. [Medline]. Knight A, Weiss P, Morales K, Gerdes M, Gutstein A, Vickery M, et al. Depression and anxiety and their association with healthcare utilization in pediatric lupus and mixed connective tissue disease patients: a cross-sectional study. Pediatr Rheumatol Online J. 2014. 12:42. [Medline]. [Full Text]. Biro E, Szekanecz Z, Czirjak L, et al. Association of systemic and thyroid autoimmune diseases. Clin Rheumatol. 2006 Mar. 25(2):240-5. [Medline]. Bodolay E, Szekanecz Z, Devenyi K, et al. Evaluation of interstitial lung disease in mixed connective tissue disease (MCTD). Rheumatology (Oxford). 2005 May. 44(5):656-61. [Medline]. Ito S, Nakamura T, Kurosawa R, Miyamae T, Imagawa T, Mori M. Glomerulonephritis in children with mixed connective tissue disease. Clin Nephrol. 2006 Sep. 66(3):160-5. [Medline]. Mier R, Ansell B, Hall MA, et al. Long term follow-up of children with mixed connective tissue disease. Lupus. 1996 Jun. 5(3):221-6. [Medline]. Mier RJ, Shishov M, Higgins GC, et al. Pediatric-onset mixed connective tissue disease. Rheum Dis Clin North Am. 2005 Aug. 31(3):483-96, vii. [Medline]. Mier RJ, Shishov M, Higgins GC, Rennebohm RM, Wortmann DW, Jerath R. Pediatric-onset mixed connective tissue disease. Rheum Dis Clin North Am. 2005 Aug. 31(3):483-96, vii. [Medline]. Singsen BH, Bernstein BH, Kornreich HK, et al. Mixed connective tissue disease in childhood. A clinical and serologic survey. J Pediatr. 1977 Jun. 90(6):893-900. [Medline]. Tiddens HA, van der Net JJ, de Graeff-Meeder ER, et al. Juvenile-onset mixed connective tissue disease: longitudinal follow-up. J Pediatr. 1993 Feb. 122(2):191-7. [Medline].